Although lattice is inexpensive and easy to install, many homeowners find it unappealing. Luckily, when it comes to skirting your deck, you have several more attractive options to choose from. Whether your goal is to blend your deck into the rest of your home or give it a unique look, your choice of skirting will help you accomplish your objective. 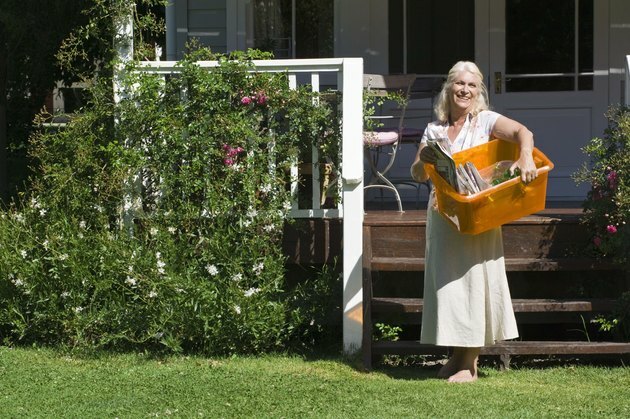 The right skirt will keep space under your deck trash- and animal-free. Several solid materials are available to finish off your deck and keep out animals. One option is to order composite trim or skirt boards that match your decking. Using the same clapboard siding that is on your house to close off the underside of a deck is also an option. Install the boards horizontally between the ground and the underside of the deck or, to make a low deck appear more elevated, install the boards vertically. Another option is to use wood panels to hide the area underneath your deck. Although this option is more expensive, it provides a finished look. Paint the panels to coordinate with the trim on your house or stain to match the deck itself. If you're searching for a more unique choice and have a deck that is close to the ground, consider using stone or brick as deck skirting. Choose brick that coordinates with the brick on your home, or stack pieces of flagstone between the ground and underside of the deck for a more rugged look. If you aren't concerned about local critters finding their way under your deck, consider using plants to conceal the space. Evergreen shrubs will hide the area year-round, and climbing vines will conceal posts. If there is enough headroom under your deck, transform the area into a shade garden, using shade-loving plants such as English ivy, lily of the valley, Japanese spurge, periwinkle, mapleleaf viburnum or gray dogwood. There is no reason why you must close off the area under your deck, so another option is forgoing skirting altogether. To give the area a finished look without a skirt, consider using bark or decorative rock under the deck area. Carry the bark or rock out past the deck a short distance to provide a border and a smoother transition to the rest of your yard. Before installing skirting under your deck, make sure that there is good drainage so standing water does not collect and attract mosquitoes. No matter which skirting you choose, install landscape fabric under your deck to prevent weed growth. Finally, if you use a solid skirting, be sure to allow adequate airflow under the deck, and include a door or removable panel so you have access if you need it in the future. Jennifer Loomis is a certified English/language arts teacher and is a writer of teaching and literature materials. She also specializes in writing home and garden articles. Loomis holds a B.A. in philosophy from Mount Mary College, a secondary English teaching certification from the University of Wisconsin Green Bay and a master's degree in English from the University of Wisconsin Oshkosh.